You could be forgiven for thinking that the title of this article referred to a horror movie, a 70′s rock band or an adolescent teenager recovering from a night on the town. However, in this context the phenomenon of “living dead” investments  represents the middle ground of venture capital investing outcomes, lying between “winners” that produce adequate multiples of return on investment and “losers” that result in loss of invested funds. Living dead investments are typically mid- to later-stage ventures that are economically self-sustaining, but fail to achieve levels of sales growth or profitability necessary to produce attractive final rates of return or exit opportunities for their venture capital investors. Whilst living dead problems caused by internal management and operational issues can potentially be fixed by VC managers, those caused by too small or too slow markets, industry oversupply, or cut throat competition are largely out of their control or influence. Of the various actions taken by VC managers in dealing with living dead companies, the most common response is to sell or merge the investee firm so they can devote their time to star performers. Ruhnka, J. Feldman, H. D. and Dean, T.J. (1992). The “Living Dead” Phenomenon in Venture Capital Investments, Journal of Business Venturing, 7,pp 137-155. Dr. Cavill is a High-Growth Entrepreneur & Educator, and Founder/CEO of Intermezzo Ventures Ltd., which provides management consulting and top management team coaching services on the subject of Growth Entrepreneurship. 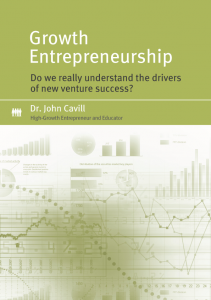 Download your FREE copy of this comprehensive 48 page review of the academic literature covering key aspects of Growth Entrepreneurship. Join over 17,000 other people who have already read this publication online. What sort of investor are you?